You’ve made the commitment and decided it's time to lose weight and to get into shape. So you do your research on the foods you should be eating and get a game plan to start working out. Your figuring out the best way to lose weight and making your grocery list. Which consists of salads, lean proteins, fruits and vegetables and healthy fats. You know what being healthy means. But here’s a way to make sure you don’t turn healthy foods into bad choices. So yes some salads have the same amount of fat and calories as a bacon cheeseburger. The key is to put the right toppings on like fresh tomatoes or crispy red and green peppers. Try ordering your dressing on the side and dipping your salad into it. Salsa and a squeeze of lime is another low calorie option that tastes great. 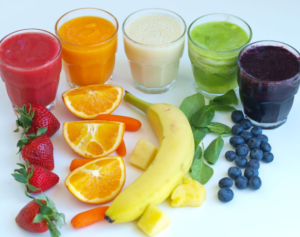 Juicing has become popular these days but buying it premade is expensive. If you’ve ever tried it at home you quickly realize it takes a lot of fruits and veggies to make a small amount. And you lose the healthy fiber. Stick to eating whole fruits and vegetables it's better for you. You may be tempted to hit the smoothie shop after your workout, but be careful. There’s a reason why they taste so good. Many stores add peanut butter, granola, flavorful syrups and full fat yogurt and call them healthy. When in reality you could be drinking 400-500 calories. A better option is whey protein, powder peanut butter (same taste with half the calories), unsweetened almond milk and fruit. It has a lot of protein and can save your waistline. A decade ago, fat was the enemy. Low fat diets became the craze but many low fat foods were loaded with sugar. Now we know better, sugar is the enemy and healthy fats are good. 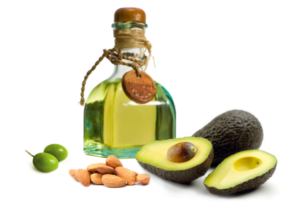 And yes monounsaturated fats like olive oil, avocados and nuts are very beneficial to your diet. But these items have 120-160 calories per serving and in most restaurants you’re getting 2-3 times that amount. One tablespoon of olive oil, 24 almonds or a ¼ of an avocado is all you need to get the heart healthy benefits of these foods. You can literally derail your whole diet by eating too much of any of these. So watch your portions and use them sparingly. Want to know the fastest way to sabotage your healthy dinner: add sauce. Unfortunately cream sauces are loaded with fat and calories. A cup of Alfredo sauce has 950 calories and 89% come from fat. It’s wise to stay away from thick creamy sauces. They may taste great but they are a caloric nightmare. Next time when you’re ordering try tomato sauce instead of Alfredo sauce or dip your veggies in salsa instead of ranch dressing. You’ll save yourself a lot of calories. It sounds so good and healthy. 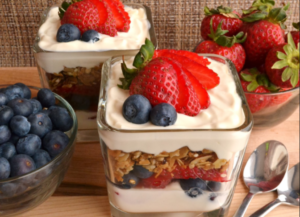 A fruit and yogurt parfait with crunchy granola. But beware, a cup of granola has a whopping 500 calories and 30 grams of fat. A seemingly innocent breakfast could cost you on the scale. Instead use low fat yogurt, berries and half cup of bran flakes for that crunch. If you must use granola then stick to a few tablespoons. Most of us are striving to be healthy and a lot of us are trying to lose weight. There are many food options that might seem like a good choice but in fact are not. Or we ruin our good choices by eating too much or dousing them in high calorie sauces. But you can make this work. Be sure to look at labels, watch portion sizes and order carefully at restaurants. 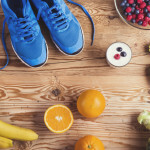 Hopefully you will use these healthy life tips and have success with your journey.